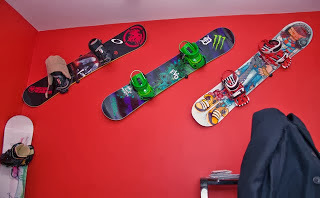 StoreYourBoard Blog: Snowboard Wall Mounts - Why YOU Need One! Snowboard Wall Mounts - Why YOU Need One! Sadly it is coming to the end of winter for many of us Snowboarders. 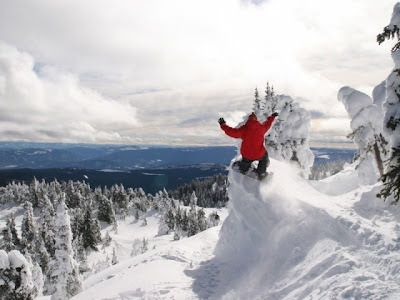 This is a great time to remember those great days out in the powder or in the park and get your last spring boarding days in for the season. The other thing you need to think about is where and how to store your snowboard for the off season. The BEST way to do this is with a SNOWBOARD WALL MOUNT. Snowboards are much more protected in a wall rack than lying on the ground or resting against something only to fall over. Why not showoff your snowboard? Let your sweet ride inspire you all year long. Check out over 25 Snowboard Wall Mounts. There is sure to be one to fit your needs and budget! It is an easy thing to put off or forget about but well worth it once you have your rack installed and snowboards stored and displayed. You won't know why you didn't get a snowboard rack sooner. If you take a little time to understand your options and get a snowboard wall rack you will be able to properly and safely store your snowboard during the off season so it is ready to go next season. Before I started http://www.storeyourboard.com/ I know most of my buddies used to just throw their snowboards in the garage, basement, or a closet only to find at the start of next season that their snowboard's edges were rusted and often times there were nicks and dings in their snowboard. They would have to take their snowboards into the snowboard shop to get a costly tune up before they even use it next season. Using a snowboard wall mount will help you organize and store your precious snowboarding gear. Another good tip for storing your snowboard over the off season is put on a thick coat of wax to protect your edges from rusting. Keeping your snowboarding in a temperature controlled dry place will also greatly help in storing your snowboard. At StoreYourBoard.com we get this question a lot...what is the best wall mount for my snowboard? The answer depends on what you are looking for. We will cover this more in depth in a future blog post. Check back to find out more. Hyperlite New System Wakeboard Bindings - SWEET! StoreYourBoard.com Blog - First Post!